Here's an adorable giraffe balloon animal that is sure to be a hit with the kids. If you would like to watch a video of the tiger being made, just follow the link. Also, subscribe to our YouTube channel to learn more balloon animals. Twisting a giraffe balloon animal is very similar to making the basic dog balloon. In fact, a giraffe, in the balloon world, is pretty much just a dog balloon with a long neck. If you can already twist a basic dog balloon, you can twist a giraffe. I strongly suggest that you first learn to twist a basic dog balloon before you try to make the giraffe. Follow the latest balloon-related news, products and happenings and ask me questions on Facebook ("friend me at "Wayne Kawamoto"), Twitter and GooglePlus. Twist three basic balloon twists. The first will be about three inches long, which will form the nose of the giraffe. The second and third twists will be smaller, about an inch each, to form "ears." Giraffe Balloon Animal - Finish the Head. Bring the first, longer twist against the main body of the balloon in preparation for a lock twist. Twist the two smaller "ears" to create a lock twist. Your balloon sculpture should now resemble the head of a giraffe. Twist three basic balloon twists, the first about five-inches, and the second and third about three-inches each. The first segment will form the giraffe's long neck. The second and third twists will form the giraffe's front legs. As you did with the giraffe's head, create a lock twist by twisting the legs and holding the rest. Your twisted balloon sculpture should now resemble the front of a giraffe with its head and front legs. Twist three basic balloon twists, the first about three inches and the second and third about three-inches. The first will form the giraffe's body. The second and third twists will form the giraffe's back legs. The final balloon segment will form the giraffe's tail. As you did with the giraffe’s front legs create a lock twist by twisting the legs and holding the rest. I think that the giraffe looks better if the hind legs are slightly shorter than the front legs, but this is a personal preference. You have now twisted a basic giraffe balloon animal. If you want to embellish your giraffe, you can add spots with a marker. The spots are definitely optional as the giraffe is identifiable and doesn't just appear to be a dog with a long neck (which is what it is). 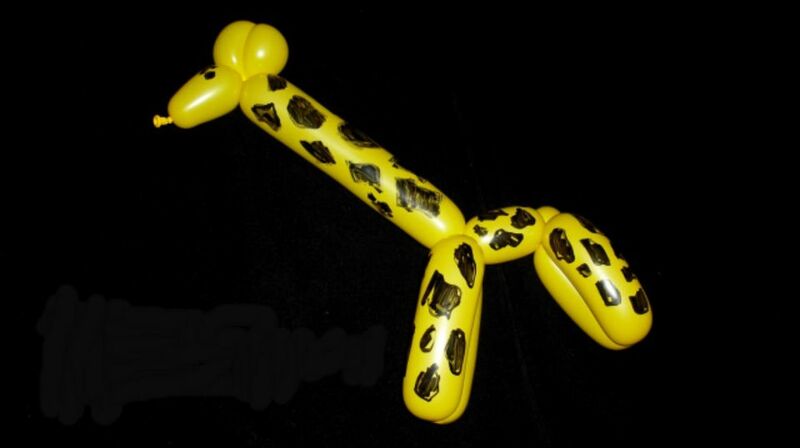 A giraffe balloon animal will be very popular at an event but be careful about making it early with the detailed spots. The application of spots is a rather time-consuming process that will slow you down significantly if you have lots of people waiting for balloons. Another tip if you decide to apply spots. I've discovered that you don't actually have to fill the spots in. If you simply outline them, spectators will get the idea of the spots. One thought on markers. I prefer to use erasable markers as opposed to Sharpie and other markers. Early on, I was told by an experienced balloon twister that there's less balloon popping when one uses an erasable (whiteboard) marker. Since then, I have used Sharpies to draw on a balloon and haven't experienced any significant popping. But I still mostly use erasable (whiteboard) markers when drawing on balloons.